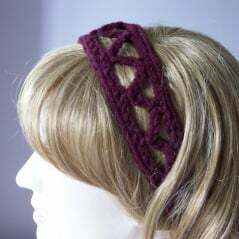 This Zig-Zag Headband crochet pattern features a nice open zig-zag pattern to help keep your hair back. It ties at the back with a couple of tie strings to allow for a comfortable fit. It’s a great gift idea because you don’t need to have exact head measurements to ensure a proper fit. This crochet headband pattern not only works up quick, but you only need a small amount of yarn, which makes this for a nice stashbuster project. You might also enjoy the crochet headband, the wide crochet headband or this easy breezy headband. Material: Red Heart Comfort, or any other worsted weight yarn. Row 1: Sc in second ch from hook and in next 9 sts, ch 5, sk next 3 sts, sc in next st, ch 6, sk next 3 sts, sc in next st, ch 7, sk next 3 sts, sc in next st, (ch 8, sk next 3 sts, sc in next st) twice, ch 7, sk next 3 sts, sc in next st, ch 6, sk next 3 sts, sc in next st, ch 5, sk next 3 sts, sc in last 10 sts. Turn. Row 2: Ch 1, sc in first 10 sts, ch 1, sc in lp, *ch 3, sc in next lp, repeat from * into last lp, ch 1, sc in last 10 sts. Turn. Row 3: Ch 1, sc in each st and ch to the end of row. Do NOT fasten off, do NOT turn. Continue with String. First String: Sl st into same st where last st was made, ch 31, sc in second ch from hook and in each ch to end, sl st into last sc made in row 1. Do NOT turn. Next row: Working along the edge of the first row, and into the back loops of the foundations chs. Sl st into back loop of first ch, ch 1, sc in each st and ch to the end. Second String: Sl st into same st where last st was made, and into next st, ch 31, sc in second ch from hook and in each ch to end, sl st into corresponding st. Fasten off. Dampen with a wet towel, and lay flat. Place wet towel on top and allow to dry. I’m having trouble with row 2 where it where it says “chain 1, sc in loop, chain 3, sc in next loop.” Do you mean only one single crochet in each loop? When I put only one in each loop, it makes that side very short and drawn up. Heidi, yes it’s supposed to be only one sc in each loop. Are your chains maybe tighter than the starting chains?.. because that might be the problem. I will try and take a look at the pattern tomorrow and see if there’s an error or something. Thanks so much for your patience. Confused as to what it means by string. Do you just mean a different color? Or something that’s not yarn? Thank you. The string is used to tie the headband at the back. Basically with same yarn, you make a number of chains (as many as you want to get the length you need for tying), then single crochet into the chains for a durable tie-string.